Amish Christy Tables feature bold post legs while also having soft curves. The occasional features large yet curved post legs. Tables shown also have a beveled edge although other edges are available. Drawers are optional in addition although shown on the end table of the group. Hardware for the drawers has almost limitless options with a full catalog available. The solid wood construction is entirely made of rustic quarter sawn oak. Rustic quarter sawn oak, consequently has more variations such as knot holes and burls. The tables also are available in other wood specie including oak, maple, cherry, and elm. Each wood specie also has a large variety of stains colors available. Sizes of the tables are customizable with almost limitless options. 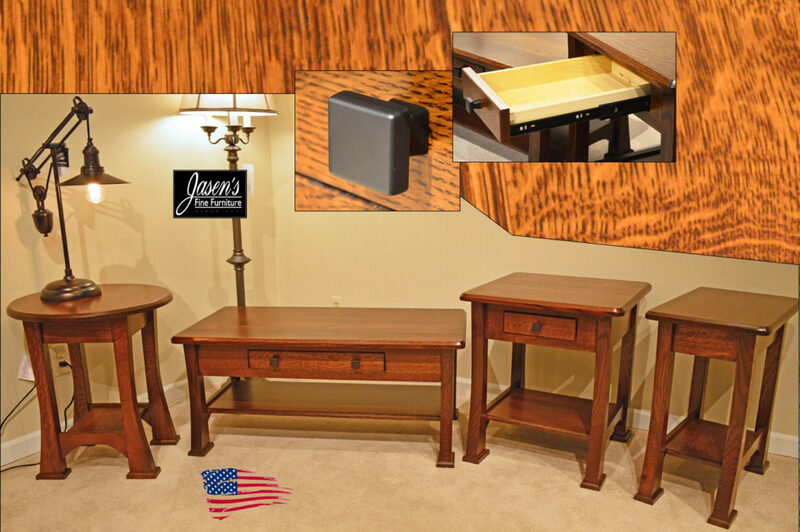 Furthermore the tables are Amish and hence made in the USA!